As new students begin their journeys at Yeshiva University, one of the first places they often visit on campus is the Career Center, which offers a multitude of resources from career planning, resume building and interview coaching to informational events, site visits and recruiting fairs. Over the last few years, the Career Center has helped more than 90 percent of graduates find jobs or enter graduate school within six months of graduation. 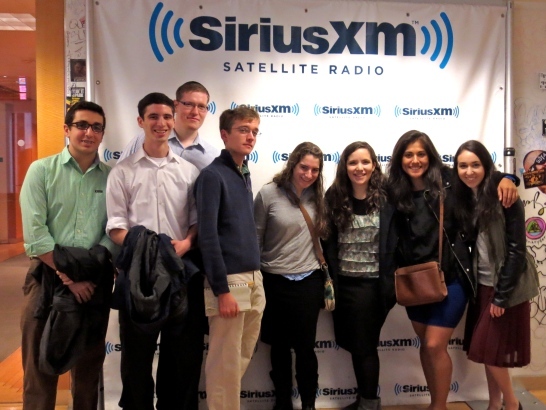 YU students on a recent Career Center site visit to Sirius XM. Part of that success is due to the valuable connections that students can make through a variety of events and networking opportunities provided by the Career Center. “Our students and the team at the YU Career Center have been able to achieve a certain level of success in great part due to our relationships with our alumni, tapping this amazing resource of professionals as mentors and employers for now and years to come,” said Marc Goldman, executive director of the Career Center. On a recent Friday, a group of students traveled to the midtown Manhattan headquarters of Sirius XM Radio, where they received a tour of the studios and recording center, and learned about internship opportunities at Sirius in fields ranging from accounting, public relations, marketing, and IT to programming, music and radio production. For Oren Herschander, a sophomore at Yeshiva College, the Sirius visit offered an inside perspective to an industry he hopes to eventually break into. An aspiring screenwriter, Herschander previously interned at a broadcast film production company, has written two screenplays, has a cartoon book coming out in January and hosts his own radio show, “Live From 185,” on YU’s WYUR radio station every Thursday night. The Career Center typically organizes three or four site visits each semester, many times in collaboration with student clubs and organizations. Previous visits have included Madison Square Garden, Bloomberg, Kenneth Cole, the New York Times, KPMG, L’Oreal, the Metropolitan Opera and Citromax. When students visited Madison Square Garden last year, four people from different industries spoke to the students, including a YU alumnus who worked as general counsel, and others employed in community relations, show development and graphic design for television. “It was a great way for students to see an example of a big company that has all different types of industries in there, which students wouldn’t have considered before,” said Jocelyn Coalter, director of employer and alumni relations at the Career Center. A vital part of these visits is networking and making contacts in a particular industry or company where a student wants to work. Last year, following a site visit to the DMEF marketing association, Sy Syms senior Danielle Chustckie connected with the head of career services there and gained acceptance to an internship program at the organization, which later was renamed MarketingEDGE. MarketingEDGE then placed her at Publisher’s Clearinghouse, where she interned this past summer as a marketing and business analyst. For other students, recruiting events have been crucial in landing them an internship. David Bodner, a senior at Yeshiva College, interned in the community affairs department at WABC-TV last summer, after connecting with a company recruiter at a Career Center event. Other recent Career Center events this year included a visit to the Harlem Link Charter School for students interested in joining Teach for America; a seminar on Google including development workshops, networking and career opportunities; a panel discussion on careers in consulting; and a finance interview boot camp event featuring various industry experts. Learn more about the YU Career Center.